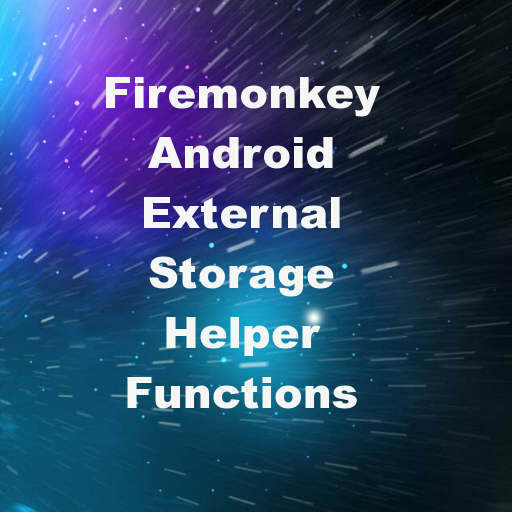 Developer Ray Vecchio has released some helper functions which makes accessing the external storage on Android in Delphi XE7 Firemonkey a bit easier. The unit is called Androidapi.IOUtilsEx.pas but it also comes with Androidapi.JNI.EnvIntf.pas and Androidapi.JNI.SystemIntf.pas. As you may know most Android devices usually have an internal storage and then an external removable storage (like a microSD card). Some of the functions available in the helper library are GetExternalStorageState, isExternalStorageWritable, isExternalStorageReadable, isExternalStorageEmulated, isExternalStorageRemovable, and getStorageState() for finding out the state of the external storage. It also has some functions for getting directory locations like GetExternalStorageDirectory, GetDataDirectory, GetDownloadCacheDirectory, and GetRootDirectory. Apparently the most robust way to get access to the external storage location is through these two functions GetSysSecondaryStorage and GetSysExternalStorage. This helper unit should also work in Appmethod. Head over and download the full helper unit for accessing external storage on Android in Delphi XE7 Firemonkey.